This species is distinguished by its long, narrow forewings and bright orange-brown color. Females are duller and lack a distinctive black marking on the leading edge of the forewing. 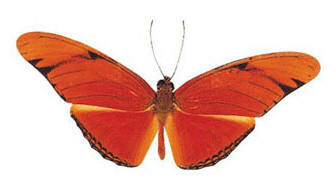 The underside is patterned with various shades of orange-buff and has two small, red spots close to the hindwing base. It visits garden flowers and wet ground.